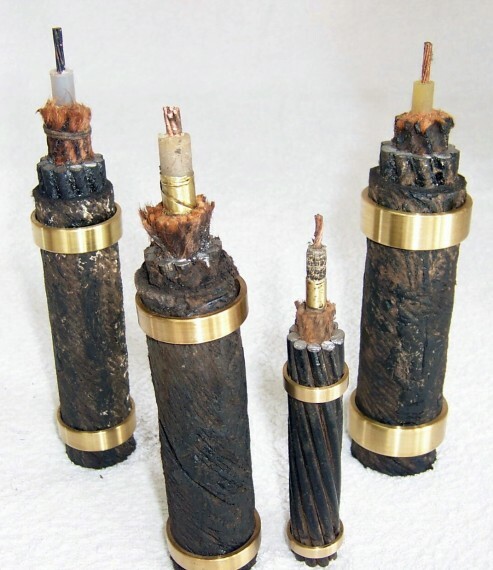 Four pieces of cables of different diameters of the sheathing wires and cores. The one at the back row, left, has each sheathing wire protected with a poliethylene sleeve. The two in this row and the one in the front row, right, were used by the Western Telegraph Co. in its P. Yeguas (Montevideo) to Colonia lines. In the front row the one at the left has “Telcothene” insulation, with anti teredo brass tape and each sheathing wire is protected by a cotton tape. Used by the Western Telegraph Co. in one of its Montevideo – Maldonado lines. The other one has gutta percha insulation and anti teredo tape.